The Strathmore Community Hall, constructed in 1955, at 40 Loeman Street, Strathmore is significant. It is a post-war building constructed of cream brick with a low-pitch hipped roof with gablets. There are high-set windows in the front and side elevations, which have brick sills. Entry is via a flat roofed porch placed off-centre, which has timber doors. To the right of the entrance 'STRATHMORE COMMUNITY HALL' is spelt in metal letters attached to the wall. 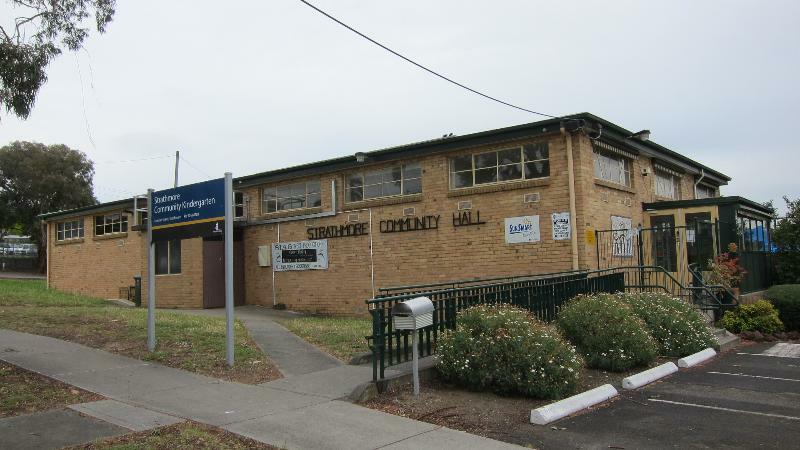 The Strathmore Community Hall is of local historic and social significance to the City of Moonee Valley. The Strathmore Community Hall is a post-war building constructed of cream brick with a low-pitch hipped roof with gablets. There are high-set windows in the front and side elevations, which have brick sills. Entry is via a flat-roofed porch placed off-centre, which has timber doors. To the right of the entrance 'STRATHMORE COMMUNITY HALL' is spelt in metal letters attached to the wall. The hall is in good condition. Alterations have been made at the east end.